Property owners agree that nothing brings greater pride than having a landscape that stands out. While many people focus so much on plants and other materials to enhance the beauty of their landscapes during the day, they forget what happens when dusk sets in and darkness encroaches. To stand out from the rest, you should invest in good landscape lighting. While it is agreeable that there are many spots to focus on as far as outdoor lighting is concerned, certain zones just can’t be ignored. Steps are some of those places. Architecturally, steps are some of the most prominent features of modern homes. At night, accidents may occur on outdoor stairs leading to the main entrance. To avoid such accidents, you can add step lights. Well-positioned step lights can contribute significantly to the attractive or even romantic impression of your home at night. You have multiple light sources to chooses from when it comes to investing in step lights. 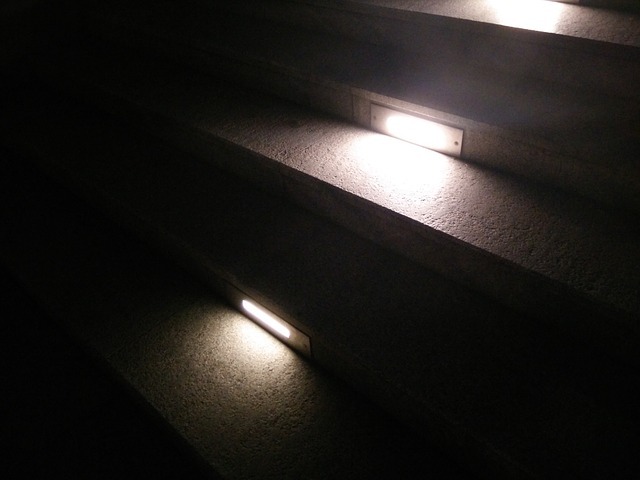 Lately, there has been a steady increase in the popularity of LED lights for the steps. Many homeowners prefer LED step lights because they utilize minimal electricity to supply ambient lighting to staircases and hallways. In addition, they do not radiate unnecessary heat. Apart from LED step lights, you can also settle on other lighting options including halogen, incandescent and fluorescent. It is important that you make up your mind on the choice of lighting source that will work well for your steps. Step lights come in various shapes and sizes. Most step lights are designed to fit in the standard power outlet gang box. As for retrofit lights, there are slight differences. They come with alternative face plates. If you are working on residential exterior lighting Houston upgrade, you can also think of investing in the smaller, circular step lights or ground-staked path lights. For a funkier feel on the steps, you can bring in LED party torches. At the end of the day, you need to select something that works perfectly for your outdoor setting. Which installation are you working on? The kind of installation you are working on will also determine your choice of step lights. If you are working on a plan of retrofitting step lights in the power outlet of the hallway, you will be restricted to strip lights that perfectly fit in wall boxes. If you want to minimize installation efforts, you can choose solar and battery operated step lights. You can even take landscape lighting design to a completely new level by installing LED tape-rope hybrid step lights! For installation involving outside decks or fenced porches, it is recommended that you have independent lights on the fence posts. Many visitors focus on the steps and staircases leading to the main entrance. To ensure these special components of your home remain functional and beautiful, it is advisable that you invest in quality step lights. To ensure you get the right outdoor lights that meet your needs, understand your needs and have realistic landscape lighting goals.